Dr. Brian Coutts, Head of Library Public Services at WKU, publishes his “Best Reference Sources” of the Year annually in the April 15 issue of Library Journal, the nation’s leading library trade journal. It’s one of two such “Best Ref” lists. Each year he gives a workshop on the “Best Reference Books” of the past year for WKU Library faculty and staff. This year’s presentation was held on Friday, April 24 at 9:00 a.m. A reception followed. More than 150 authors for adults and children attended this yearâ€™s Southern Kentucky Book Fest, a free event organized by the partners of WKU Libraries, Warrent County Public Library and Barnes & Noble Booksellers in Bolwing Green, Kentucky and sponsored by local businesses such as Dollar General, Jim Johnson, Fruit of the Loom, Citizens First Bank, The Law Office of Jennifer L. Brinkly, PLLC and many others. The 2009 Book Fest was held on April 18 at the Sloan Convention Center and featured Elmo puppeteer Kevin Clash, Sweet Potato Queen Jill Conner Browne, best-selling teen author Ellen Hopkins, A Journal for Jordan author Dana Canedy, and many others. On the evening of Friday, April 17, 2009 in the Kentucky Building on WKU campus, the University and Bowling Green community members and leaders met authors coming to the Southern Kentucky Book Fest to take place the next day at the Sloan Convention Center, Bowling Green, Kentucky. 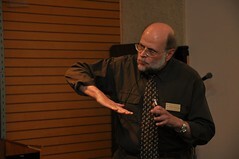 On the evening of April 16 at Barnes & Noble Booksellers, WKU Librariesâ€™ Far Away Places Series featured Dr. Michael Trapasso from the Department of Geography and Geology at WKU. Trapasso provided a unique and fascinating look at retracing the â€œViking Voyages.â€ Many WKU faculty and students as well as local community members attended the lecture. Since earning a PhD in climatology Michael has taught a variety of classes at WKU, served as Director of the College Heights Weather Station and hosted â€œUp in the Airâ€ Thursday mornings on WKYU-FM. Heâ€™s one of Westernâ€™s most traveled scholars having set foot on every continent and dipped his body in every ocean. His â€œViking Missionâ€™ began with a trip to Norway in 1999 where he began to research their ships and their voyages. He continued in 2003 with a visit to Iceland which was originally settled and populated by Vikings. In 2004 he returned for a second visit and traveled to Greenland. Late that summer, Trapasso visited Newfoundland where the Vikings established their first village on North American soil. Mission accomplished! WKU Libraries and Glasgow Community celebrated the 20th anniversary of the Glasgow Campus Library on April 15, 2009. Dr. Mike Binder, Dean of University, welcomed the audience and introduced the speakers. Dr. Juanita Bayless, Glasgow Campus Director; Dr. Brian Coutts, Head of Department of Libraries; Monica Conrad, President of Glasgow Business & Professional Women’s Club; Georgia Beth Albany, Past President of Glasgow Business & Professional Women’s Club; and Kath Pennavaria, Glasgow Library Coordinator took the floor. President at the celebration were Mayor of Glasgow City, faculty and staff from the Main Library and the Glasgow Library, as well as Glasgow Campus students. 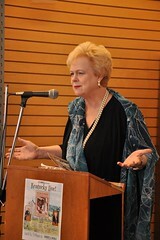 Author Georgia Green Stamper spoke about her book in the “Kentucky Live Series” on Thursday, April 9, 2009 at Barnes & Noble. A native of Owen County in North Central Kentucky Georgia grew up on a tobacco farm on Eagle Creek not far from Corinth. She writes that the building of US Highway 25 in the 1920s though Corinth caused a population boom sending the towns numbers soaring to 265. 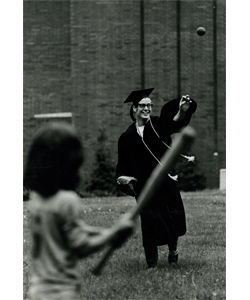 After graduating from Transylvania University she taught English and theater and coached speech. She and her husband, an executive with Ashland Inc. lived in Ashland and raised three daughters. When the last of her three daughters had graduated from college in 1999 she turned her attentions to writing. Her essays have been published in literary anthologies like New Growth (Jesse Stuart Foundation); Tobacco (Wind Publications); Daughters of the Land (Texas Tech University Press) and the Journal of Kentucky Studies. In 2004 she began writing a bi-weekly column, Georgia on My Mind, for the Owenton News Herald. Her most recent story quite fittingly coming during â€œMarch Madness and the Sweet Sixteen Basketball Tournamentsâ€ describes the Corinth High School (student body 74) boys basketball team which won the Kentucky State Championship in April 1930 and played in the National Interscholastic Basketball Tournament in Chicago. Their coach was Ted Hornback who would later be Athletic Director at WKU. In 2006 she became a regular commentator for NPR member station WUKY in Lexington, Kentucky which has broadcast more than 60 of her commentaries including memorable ones on the â€œperils of dietingâ€ which tells how a childhood incident of making â€œmanure piesâ€ prepared her to do battle with Atkins, South Beach and Weight Watchers. Her five grandchildren provide fodder for other tales. A crowd of 80 administrators, faculty, students and community members met in Helm Library Room 100 to celebrate WKUâ€™s 75th Anniversary of the Federal Depository Library Program. Dr. Mike Binder, Dean of University Libraries, welcomed the group and gave a brief history. Provost Dr. Barbara Burch introduced US Congressman Brett Guthrie who gave brief remarks regarding the importance of our US Government collection. Rosemary Meszaros, the Depository Librarian, thanked committee members and turned the talk over to Dr. Edward Yager from the Political Science Department. Tours of the Depository and Refreshments were offered upon the conclusion of the program. WKU Libraries presented Joseph Trafton, Distinguished Professor of Religious Studies at WKU, who spoke on â€œThe Dead Sea Scrollsâ€ as part of the “Far Away Places Series” at Barnes & Noble Bookstore (1680 Campbell Lane) on the evening of March 19th, 2009. The Dead Sea Scrolls were discovered in eleven caves along the northwest shore of the Dead Sea between the years 1947 and 1956. The area is 13 miles east of Jerusalem and is 1300 feet below sea level. The mostly fragmented texts, are numbered according to the cave that they came out of. They have been called the greatest manuscript discovery of modern times. Trafton, who has a M.T.S. and Th.M. from the Gordon-Conwell Theological Seminary and a PhD from Duke, was first introduced to the Dead Sea Scrolls during his masters work in a course on the Jewish setting of the New Testament. He continued studying about the scrolls at Duke. When his adviser moved to the Princeton Theological Seminary, Joe was invited to be part of an international team of scholars assembled to edit and translate the scrolls called the Princeton Theological Seminary Dead Sea Scrolls Project. He was assigned five fragmentary scrolls, the first of which was published in 2002. As part of his research he has traveled to Israel and visited Qumran, the archaeological site connected with the scrolls. At WKU he teaches an undergraduate course on the Dead Sea Scrolls.